In fact, we have been doing something about it for many thousands of years. An inverted pyramid of geniuses and giants, modern medicine, nutrition, sanitation, and assorted other innovations has extended our lifespans and helped more of us live to ripe old ages. That�s wonderful� but it�s also a problem many of us still don�t fully understand. Of course, I�ve helped my elderly parents and others but this poignant experience gave me new awareness of my own age. It also increased my determination not to go gently into that good night. And, to today�s topic, it helped draw my attention to aging and demographics as they relate to my series on debt. Aside from death, aging brings financial and cultural problems. We are simply not prepared for a world in which old people outnumber the young. But it may be coming, thanks to life extension at the upper end and falling fertility rates below. National pension systems�what we call Social Security in the US but similar elsewhere�are not designed for that combination. They presume a high ratio of working young to retired old citizens. That is no longer happening and is increasingly hard to ignore. A dwindling minority of us has long warned that demographic changes are making Social Security unsustainable. Here�s a chart I shared earlier this year in The Pension Train Has No Seat Belts. The chart doesn�t show the full progression. In 1940 the Social Security system had 159.4 workers per beneficiary then went off the rails quickly. By 1945 the ratio was down to 41.9 and a decade later was in single digits. A variety of measures, from higher tax rates to (slightly) raising the retirement age, have flattened the trajectory but it is still slipping lower. We usually think this is a result of the Baby Boom generation turning 65, and that�s a big part of it. But rising life expectancy is equally and maybe more important. People now live longer, which lowers the ratio and means they collect more years of benefits than previous generations. Let�s stop here and think about this �retirement� concept. It is, in the history of man, relatively new. For millennia, the idea that a physically able person of �non-royal� blood would simply stop working and enter a life of leisure was unthinkable. You worked as long as you could, declined quickly and then died. Very simple and, more to the point, financially sustainable most of the time. Note also, in much of the world �retirement� is still a dream. Even the elderly are expected to contribute something to the community, as long as they are able. What we have in the developed countries is still not the norm globally. However, it has limits. I don�t know of anyone who, when the retirement systems were created, thought it made sense for average people to spend the last 30% or 35% of their lives in retirement, at the broader society�s expense. They would�ve expressed that concept in words along the lines of, �That�s nuts!� And yet we are trying to do it. No surprise, the seams of our retirement dream are beginning to unravel. The problem is not simply that there are so many Baby Boomers. It is that we have so many Baby Boomers and they�re living longer than previous generations did. Not in every single case, obviously, but the aggregate difference is dramatic. 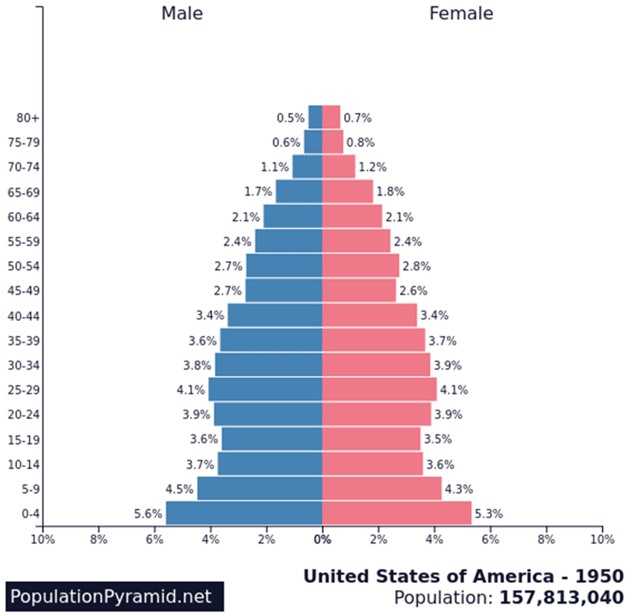 We can illustrate this with �population pyramid� charts, which show age distribution in graphic form. Here�s the US in 1950. That widest bar at the bottom is the beginning of the Baby Boom, including me. Add up the male and female sides of the top four bars and we see 8.4% of the population was over 65, and 1.2% was aged 80 or above. Now, let�s roll forward 50 years to the year 2000. Notice a few things here. 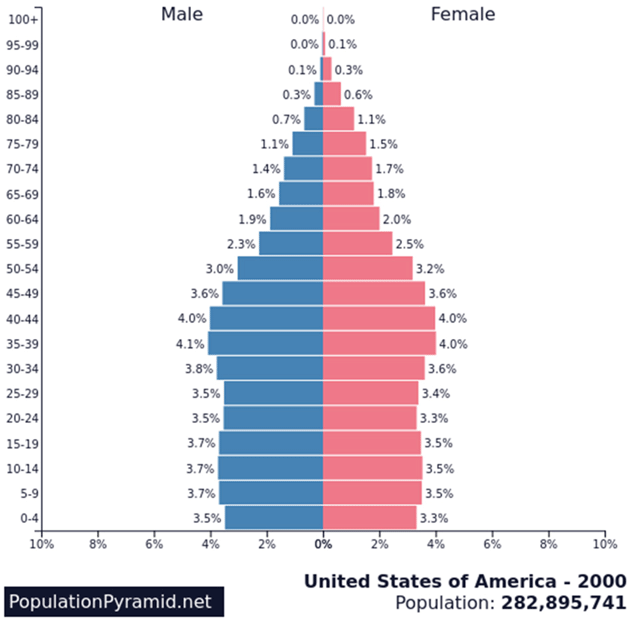 First, the pyramid�s base is narrower because there are relatively fewer children. That bulge in the 35-54 brackets is the Baby Boom. But for our purposes, look especially at the top. The 65+ share of the population went from 8.4% in 1950 to 12.3% in 2000. The 80+ category�all in one bar 50 years earlier�now gets split into five bars and is 3.2% of the population, almost tripling since 1950. But wait, that�s not all. 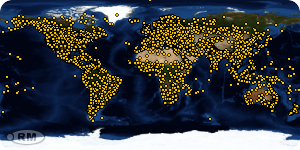 Here�s the same chart projected forward to 2050. 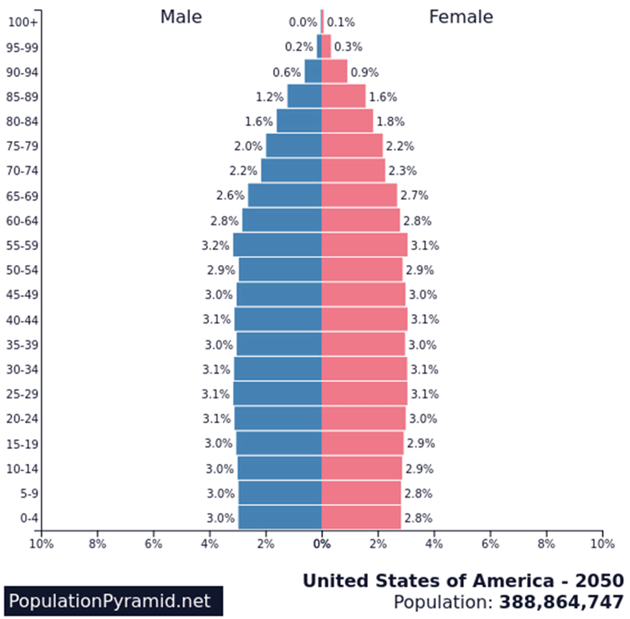 If this estimate is right, then in 2050 some 22.3% of the US population will be over 65 and 8.3% will be over 80. Both would be huge increases since 2000� but I think the chart is probably wrong, and not in a helpful way, at least in terms of paying for unfunded liabilities. You see, the current mortality tables don�t include the age-extending technologies I believe are coming in the next decade. Lots of folks aren�t going to die on schedule and, absent a major fertility increase to grow the younger population, those top rows will widen further. The pyramids are becoming more like rectangles. That means by 2050 the working-age population will be less than half the total, and yet have to support its children and elders? I don�t think so. Something will break first. The most likely (and most benign) candidate is a redefinition of �working age� at the upper end. There�s nothing magical about retiring at 65 or 67. Those were legislative choices, rooted in times when few people lived that long and most of those who did were physically incapable of going much longer. That is rarely the case now. I�m knocking on 70 and still work as full-time as I ever did, and I�m surrounded by friends my age and older who are just as active or more active than I am. 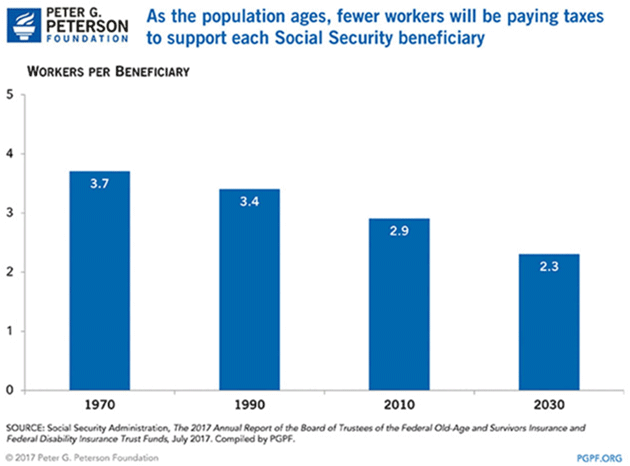 What should have happened, years ago, was an increase in the Social Security eligibility age to 70 or beyond, to reflect rising life expectancy and better health. People would have known to expect it and been able to plan accordingly. That didn�t happen so now we have to scramble for solutions. Though it�s not all that popular, I wouldn�t oppose means testing (no Social Security income over X income level) as part of a �solution.� Whatever we do is going to disappoint many folks. The only question is whom. The first option is obviously better, but is it feasible? For most people, no, even at today�s life expectancies. A surprising number of people die with negative assets, i.e. debt, having never repaid money borrowed earlier in life. Now, is it mathematically possible to save enough in those 40 years to fund another 30 or 40 years of retirement? Probably not. Sure, you might build a business or invent a new technology, but the average working person can only save so much of their income, and basic retirement living costs will consume most of it in less than 30 years. Then what? Traditional �retirement� will grow increasingly out of reach, available only to the very highest-earning tier of the population. This is what my British friends call a �sticky wicket.� The good news is we will soon be living longer. The bad news is we will soon be living longer. Since the technology is coming regardless, we need ways to reconcile the costs and benefits. It is not at all clear how we will do so. My editor and long-time friend/associate Patrick Watson and I have been discussing this for years. He expects some kind of Soylent Green solution. My sunny nature makes me more optimistic; I think we�ll find better answers that reduce the costs and spread the benefits widely. My associate Patrick Cox covers the extraordinary biotechnologies under development, and he has introduced me to some of the most fascinating scientists in the sector. I talked with two medical researchers today. Both are optimistic about not just increasing our lifespans but prolonging our health spans. Others think we can someday reverse the aging process. I think it is highly likely a major medical journal will use the words �age reversal� within the next few years. To that end, we�re launching a new division called Health & Wealth Research. Led by Patrick Cox and Senior Healthcare Analyst Chris Wood, it will be a central source for information on healthy living, life extension technology, and related investment opportunities. If you just can�t wait, you can sign up for our new weekly letter (free) by going here. It�s called A Rich Life and will be written by Chris Wood (really a top-notch analyst�I�m thrilled we have him) with contributions from Dr. Roizen and Patrick Cox. Sign up today and you�ll receive the inaugural issue on December 3. Shane and I will be leaving for Puerto Rico at the end of next week then we�ll fly to Cleveland to go through the Executive Wellness Program at the Cleveland Clinic with the head of the program, the above-mentioned Dr. Mike Roizen. Taking care of yourself is more than just working out and eating the right foods. It is also making sure you get regular medical care and checkups. Everyone should have a thorough full-body checkup at least every two years, along with regular blood tests (and, as I just learned, check your blood pressure regularly). I can hear my mother saying, �Prevention is 90% of the cure� (and I think Shane says this as well). 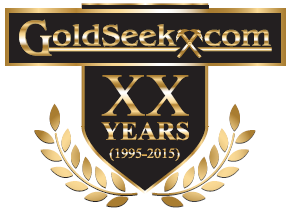 I will be traveling to Boca Raton in late January for the Tiger 21 conference, so if you�re going, let me know so we can be sure to meet. As I wrote those opening thoughts on the human drive for survival, it occurred to me that more than a few people worry about artificially intelligent machines �waking up� to threaten our survival. Until we see machines worrying about their own survival, I think they will really be just very useful tools and not actually self-aware. We can worry about being replaced when they start worrying about the future upgrade replacing them. Until then? I have other things on my mind. Whether some computer with artificial intelligence can pass a �Turing Test� and simulate human behavior is trivial compared to even a virus�s survival instinct. Call it the Mauldin Test for true intelligence.